My carissima amica Diana Strinati Baur recently broke up with her guru, which you can read about at My Guru Rejected Me: A Tale of Practicing What I Preach. That post at DianaBaur.com is about rejection, yes, but mostly it’s about redemption, and coincidentally enough, changing the path back to her. 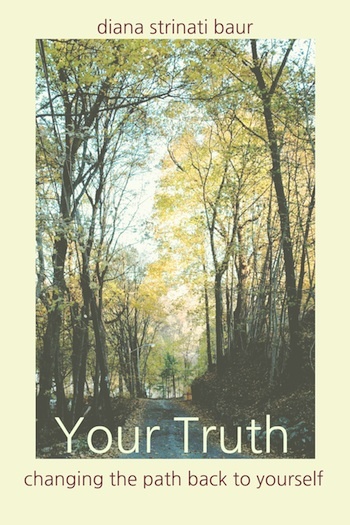 Why yes, “changing the path back to you” is the subtitle of Diana’s fabulous new ebook, Your Truth (Kindle; PDF). And that is why her post title also mentions practicing what she preaches. But I loved the second half of Diana’s post even more, the part originally meant for her guru’s site. But as the Universe would have it, here it is at Bleeding Espresso. I couldn’t be more proud to provide a home for this beautifully written and oozing-with-truth post. Diana’s ex-guru’s loss is our gain. I’ve always seemed to attract complexity. I’ve aimed to keep it simple, but it never really worked out that way. Until our move to Italy, that is. Because before simplicity could take root for me here, complexity would have its way with me. After almost two decades of playing international corporate executive tag – first him with the big job, then me, then him again, we decided basta! We both wanted out of the highly paid rat race badly enough to gallop at full speed towards the baby boomers’ quintessential fantasy rendition of the simple life. Visions of ladies even older than moi sprinting around on red Vespas with bottles of wine threatening to fall out of their baskets permeated my daydreams as I packed up our penthouse condo in Germany and sold the BMW (which, to be honest, was harder to part with than the condo itself. I loved that car almost inappropriately). Because, really, what could be more simple than buying a pile of rocks on a hill in a foreign country, restoring it with every penny you have (and a few you don’t) into a five star B&B, and getting it booked with internationals from all over the globe with no marketing budget when you don’t even speak the language? And of course, I wanted to make the art and the plates. By hand. Oh, when Type A people try to do simple things. When we take on change, we expect that we’ll automatically morph into the perfect personalities for the new situation. But we don’t. Taking on radical change at upper midlife is hard enough if you’re just messing with the externals (i.e., income, language, country, cement mixing, and stone laying skills). But if you have to change the inside of yourself too? That might be asking for one bottle more than the Vespa basket can carry. At least at first. Thinking that massive life change is going to be easy is just silly–the kind of silliness that can lead to a full-blown nervous breakdown. Several months before having committed our lives to this Italian project, I was in the hospital ready to have my gall bladder removed. It had been bothering me, and I thought I’d get it checked off the list in Germany before taking on the abyss of the Italian health care system. In a beautiful private clinic in Hamburg, they sent a psychologist around to my room to ask a few questions right before putting me under. I told him why I was having the surgery. About my list. About getting things checked off. I shrugged my shoulders. Sure. An organ that was not currently playing along with the program. Let’s get rid of the damn thing and move on. Doctor Blue Eyes sure asked a lot of questions. I struggled to understand what he was trying to tell me. But by the time the little surgical cuts had healed, I forgot about the whole conversation. Like clock work, four months later, after signing the deed and taking over the property in Italy, I was back at the hospital, this time crippled from the panicked, obsessive thought that we would fail and end up dead broke. Or worse. Drugs and therapy patched me back together temporarily, but honestly, had you told me at that moment we’d one day be the top rated B&B in our area of Italy, I’d be a successful artist and have two books coming out, I might have hurt you. Or myself. Once in Italy, we worked our backsides off like two crazy people. Some dolce vita. The results were astonishing and right on target. But succeeding beyond our dreams didn’t stop a second collision with panic from almost wrecking our lives just a few years ago. This horrific bout was even worse than the first. Because while the first one in Germany was fraught with massive change and adjustment on the outside, the second was all about having to change myself on the inside. No pills or therapy would help this time. This was the chance, maybe my only one, to accept responsibility for the consequences of what we had put into action by moving here in the first place. It was time to stop obsessing and assuming that everything would go wrong. I needed to wake up to the fact that manifesting change delivered us into a more conscious state of being, one where we embraced uncertainty, survived and thrived in an alien world. Allowing panic to control my life had not added one thing to the equation to make it easier, but instead drained the joy out of every small and large success we had had along the way. It was high time for me to stop doing that to myself and to my partner. I knew I would do what it took to get clear on who I was and what was essential to my own personal happiness. In the aftermath of a long recovery, I’ve come to accept my new life in a way that I never imagined possible. I am now able to see the magic that surrounds us in these stunningly beautiful Italian wine hills, to really hear the guests’ loving comments, and be thankful for my husband’s loving hand as it reaches across the table, offering me comfort and support. Italy is the framework for my redemption, and this house, this unwaveringly steady and stunning pile of rocks, is the unconditional love that I needed in order to become the woman I am today. All of this has filled me with an abundance of grace and gratitude that I’ve never known before. So maybe complexity isn’t my destiny. Maybe simple, done well, is just fine. 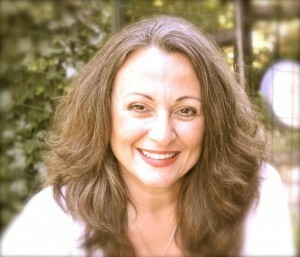 Diana Strinati Baur is an American writer, artist, life coach and innkeeper living and working in Northwestern Italy. In 2003, she and her husband sold everything and bought an abandoned Moscato farm in Acqui Terme, Piemonte, Italy, transforming the derelict property into an elegant, top rated bed and breakfast. She used her day journals as the basis of her first blog, and has written two books: Your Truth – Changing the Path Back To Yourself, a self-published ebook about embracing risk and life change as a motor for personal growth, and True Vines, a novel to be published by Gemelli Press in October of 2012. Diana sells her hand crafted ceramics internationally. What a great story, beautifully told. Such an important lesson — learning to let go and reduce complexity– and so hard to get in our modern world. You two move fast! excellent! Thanks for sharing this post about your friend’s journey – I always enjoy those that stress the value of simplicity. I think it’s something a lot of us long for (especially those of us living in the states), yet achieving it can be so complicated. It’s nice to read the perspective of those who have actually been able to find their “happy place”, in this world, and about all the bumps along the road that took you both there. Thanks so much for introducing me to Diana – I have already been reading her book, Your Truth… and really enjoying it. And now this month’s blog entry – wow! I am invigorated and encouraged by reading both her and your blogs. Appreciate so much you both sharing your journeys. Thank you. I needed that. How generous of you and your friend to publish such personal, soul-baring insights. I get the sense that you both have a great dala of inner peace and courage.